It's a brave band that chooses a name featuring punctuation. Since it seems a fair number of the literate population can't use it properly at the best of times, the ever-present risk of getting missed in the search results because of a stray full-stop or a misplaced comma is always going to be a worry. Indeed, I've seen several attempts at this name scattered around the internet already with varying levels of similarity to the band's preferred version. But that's perhaps a fair indication of where People, Places, Maps are coming from - they do things properly, they don't cut corners and they work damn hard at what they do. But they're not going to get too upset if we don't dot our i's now and then I'm sure. So, having passed comment on their free-to-download EP earlier in the year I'd been looking forward to this release for a while. Then in a pretty typical muddle of work, travel and general senility I completely missed the release and find myself catching up a little later than planned. But here it is at last, the debut album - notably completely shorn of any confusing punctuation on it's stark, atmospherically out-of-focus cover - but still as achingly desperate to convey it's messages as ever. Opening gambit "Pyromaniac" is strident, urgent pop dotted with explosive squalls of guitar which propel things through plenty of stomach-flipping dynamic shifts, just the way this kind of music should. The rhythm section here - nominally Matt Arnott and Steven Ferguson - is particularly robust, solidly driving the angry initial burst of the album forward as it means to continue. Title track "The Distance Tricked Us" starts with a dizzy swell of melodic guitar lines and develops in an anthemic vein, which also runs through Ryan McGlone's breathlessly eager vocals. This is proper guitar pop music in that long Scottish tradition which links bruised emotions to irresistible swirls of melody. The moody organ-based shimmer of "I Get So Cold I Get Nervous" couples with an acoustic guitar and a lyrical, regret-tinged vocal delivered in a heartfelt Dunfermline vernacular. There is a lightness of touch here that is often missed by bands who use their debut album to attempt to convey all of their ideas in one hit. People, Places, Maps though, show a surprising understatement and manage to focus the songs almost perfectly. Lyrically too, the songs here aren't afraid to tackle sometimes tricky, raw concepts which don't often belong in pop music - illustrated well by dark-edged couplets like "in our advancing years/she needs me to conquer her fears" which hint at difficult times and uneasy thoughts. Loathe as I am to make gratuitous comparisons, the broader canvas deployed on "The Distance Tricked Us" reminds me of bands like Endor perhaps, who make a virtue out of their multi-instrumental talents without appearing showy or over-egging things. So when, amid the little touches of piano and carefully brief washes of strings, a female vocal foil is introduced on "Bury Your Head" it marks a gentler musical approach which is no less direct and insistent. The album includes a number of the tracks from the debut EP, which I've mentioned before here including the painful ache of "Sarah's Song" which is just as moving and gently emotive now as it was on a first listen. Sitting here among a wider selection of People, Places, Maps work it remains a stand-out and is surely guaranteed to melt the hardest of hearts. "High Regard" is a little more upbeat and delivered on a cinematic scale - adding a piano and some distant string sounds, and working up into a miniature epic with enough rough edges to keep it rooted in real life. The album closes with "Deconstruct the Familiar" which may well serve as the band's manifesto just now with it's opening line of "Although we might start small/we've got big plans on the go". Again the rhythm section urges this song through it's quiet opening into a soaring tangle of guitars. It's a curious time to be releasing a record, as the end-of-year-lists are already compiled and hitting the blogs, and folks are busy making sure they've namechecked all the right people in their picks for the top next year. It would be easy enough to let a release just now slip entirely through the net perhaps? But where this record stands out and demands attention is in the unashamed attention to writing great tunes, literate lyrics and splicing them into an honest, spirited collection of songs. People, Places, Maps manage endlessly to deploy the neat songwriting trick of elevating commonplace minutiae into significant moments, and capturing them to deliver little shocks of familiarity. So if you find yourself idly browsing for something to spend that iTunes gift voucher on, forget the pick-of-2011 lists and the albums everyone else thinks you should hear and give this a go. I don't think you'll regret it. 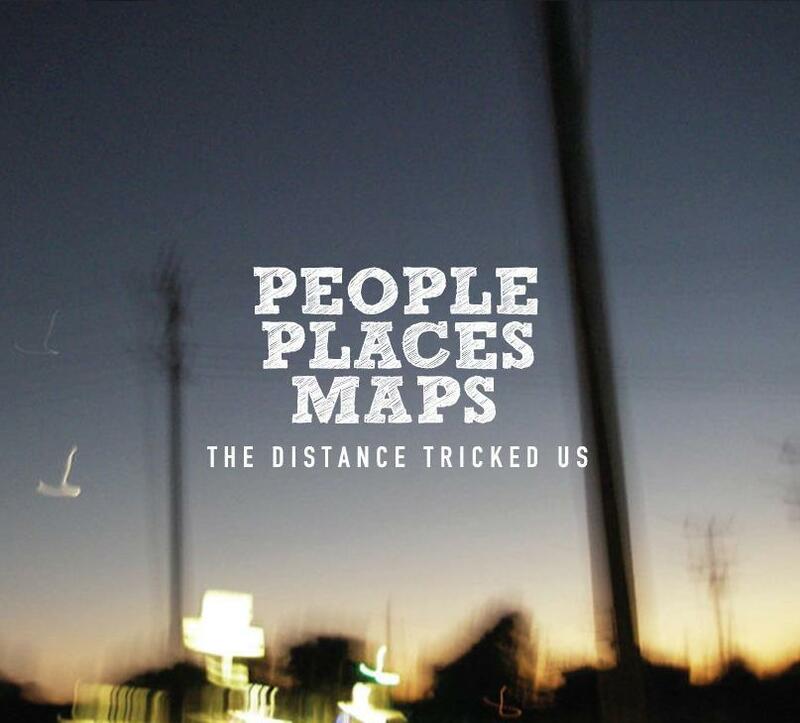 "The Distance Tricked Us" is available from iTunes. You can still download the non-album track "Fear of the Modern" for absolutely nothing at Project Rodney.